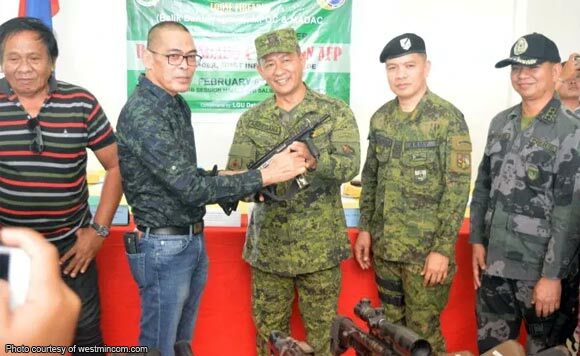 Mayor Norodin Salasal of Datu Salibo, Maguindanao has led the turnover of 13-high powered firearms to the military, Western Mindanao Command (Westmincom) said. Quoting Salasal, Westmincom said that the surrendered firearms came from the residents of the town. The weapons include Barrett sniper rifle, Caliber .30 rifle, Rocket-propelled grenade launcher, M14 rifle, KG9 rifle, Uzi Caliber, and seven M79 grenade launchers. “This (surrender) manifests that we are making a progress in our campaign to end the proliferation of loose firearms in Datu Salibo,” said Major General Cirilito Sobejana, Joint Task Force Central Commander. “This is also an offshoot of our persistent operations and cooperation with the police and the local government units in the area of operations,” he added. Police Senior Superintendent Ronald Briones, Maguindanao Officer-in-charge Provincial Director; Datu Salibo Vice-Mayor Ingkong Mamantal; chairmen of 17 barangays in Datu Salibo; and other constituents witnessed the turnover in Barangay Sambulawan on Wednesday, February 6.